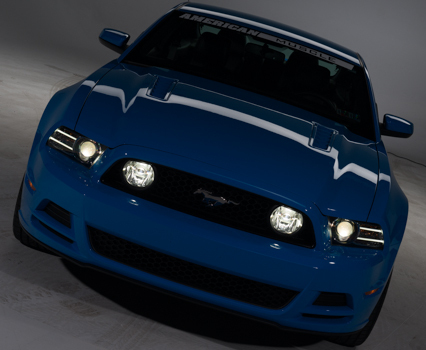 Video: Help Name Our Brand New 2014 Mustang Project Car! Here at AmericanMuscle, we’re proud to announce our newest addition to the Mustang fleet–this brand new Grabber Blue 2014 Mustang GT and soon-to-be project car. There’s just one problem, we don’t have a crafty name for it yet. That’s where you come in. We’re leaving it up to you to name this 2014 GT and pick up all the bragging rights that come with it. Comment and tell us what you think the name should be and what modifications we should do to this beast! BLUE THUNDA, Like my DOG. Well… Seeing this is the last of this body style, I say go all out. Project “Gotta grab it blue”. Drag race suspension, roll cage and a Ford Racing ” Aluminator ” crate motor and Hellian twin turbo setup. American muscle at its fastest! Let’s show these imports what we can do! Twin turbo muscle car running 9’s!!? Badder Blue to represent the color of Grabber Blue! Its Blue and black…..”BRUZER” it is! I have a Grabber blue 2014 GT myself and love the color. Cant wait to see what your going to do. Blue Tsunami – one of the deadliest forces in the world. It a force that once it catches you off guard it’s to late, you’re done. I know AM will make it awesome no matter what the name is! The name should be “Black-N-Blu”. Blue streak – because that’s all you’ll see when it drives by…..
Project Car Name: Blue Meanie. Have Chip Foose design & sign his sketches & the finished car. The exterior would have carbon fiber hood, front fenders, roof, trunk, front & rear fascia, chin spoiler, side skirts/rocker panels, rear wing spoiler, rear diffuser/splitters. Saleen Dark Horse Extreme headlight splitter, chin spoiler, side skirts/rocker panels & rear wing spoiler. Ring Brothers Switchback billet quarter-window inserts with a gas filer & surround & rear diffuser. A Foose custom two-tone paint job featuring Grabber Blue. The carbon fiber roof would not be painted. Also, the Saleen Dark Horse Extreme chin spoiler, side skirts/rocker panels & rear wing spoiler would be wrapped in carbon fiber. Foose wheels wrapped in Nitto tires. The Foose interior would have more carbon fiber bits & pieces. The interior would be reupholstered using the factory door panels and seats, with Katzkin charcoal leather & Grabber Blue inserts & a Scott Drake shift boot with a Grabber Blue Start button in the center stack. Also a Foose custom two-tone steering wheel featuring Grabber Blue. Finally, a Foose custom rear seat delete in the rear of the car. The naturally aspirated 5.0 Coyote engine’s HP would be increased to 470 – 490 hp in keeping w/the new 2015 Mustang HP #’s. Torque would be increased likewise. A custom Magnaflow exhaust would be installed. The suspension would be improved (Ig + on the skidpad). The chassis would be stiffened. The brakes would be improved (60 – 0 mph in 107 ft. or less). Other performance improvements such as 1 piece aluminum driveshaft, 9″ Moser rear end, cooling & electrical systems.